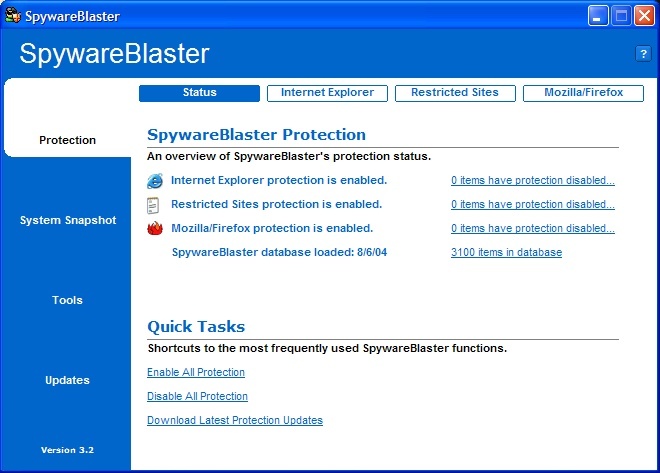 SpywareBlaster doesn't scan and clean for spyware - it prevents it from ever being installed. By setting a "kill bit" for spyware ActiveX controls, it can prevent the installation of any spyware ActiveX controls from a webpage. It does this while not interfering with "friendly" ActiveX controls - so your browser can work correctly and you can have peace of mind. You won't get any more annoying "Yes/No" boxes popped up, asking you to install a spyware ActiveX control. In fact, Internet Explorer will never even download or run the spyware ActiveX control. In addition, it can prevent many of these spyware ActiveX controls from running, even if they are already installed on your system. 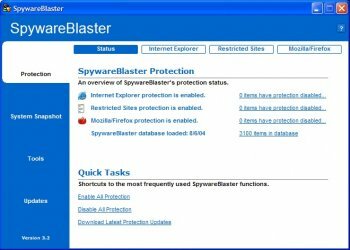 Hard to rate as it's always unknown whether its really stopped Spyware registry items being applied - However I never pick up any Spyware so SpywareBlaster probably helps a great deal, never caused any issues either. Must get around to donating! @nilst2006, no offense but your a idiot. Google Chrome has a built in Sandbox which means overall it's very secure. I'm not the biggest fan of Chrome, in general but to say its Spyware is absolutely ridiculous. From the 1st of March i boycott all Google services due to invasion of my privacy. There are alternatives online. Used this program for years, but now I only use Chrome, and the program does nothing for Chrome, so I have to say bye. But thank you for a great program, and for those who use one of the supported browsers, get this program. I have used this for a long time but since I use Chrome and Opera almost exclusively I don't think it is helping much. Maybe for the rare times I need to open a site in IE (and then I use Maxthon). SpywareBlaster, together with Spybot S&D, two faithful companions ever since my very first days on the Web. BTW, version 4.3 is available as of today. I've been using SpywareBlaster together with SpyBot S&D ever since it first came out. Never had a single problem with it, and unlike some antispyware it doesn't seem to cause any problems or slow Internet Explorer down. Great program. It is the first program I put on any new computer. Totally destroyed my USB mouse drivers on my laptop. So far, nothing, not even a system restore, has been able to regain USB mouse capability on the laptop. Was this EVER tested? By using this several years ago, and even today; I'm able to use Internet Explorer without any worries of spontaneous Spyware attacks, absolutely NONE.